Search Engine Optimization(SEO) is the backbone of a digital business. 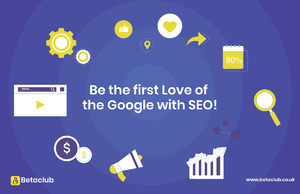 SEO is a process of strategies and techniques used to increase the amount of visitors to a website organically by obtaining a high-ranking placement in the search results page of a search engine. Betaclub is a top-notch digital marketing agency in London, UK which offers innovative solutions for your business. We like to keep things simple, affordable and the best quality work. And we assure your Online marketing campaign gets you the highest ROI possible.